I've been having an interiors moment of late. Perhaps it's because I finally painted the front room; maybe it's the imminent arrival of a new bathroom suite. Or, it could be down to the recently finished double-glazing-and-flash-new-blinds project that has seen my flat flooded with light – and filled with brawny men – for the first time in years. 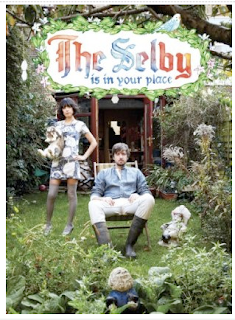 Whatever it is, when it comes to inspiration www.theselby.com is my first (and often last) port of call. Bead: a small, usually round object of glass, wood, stone or the like with a hole through it. Often strung with others of its kind in necklaces, rosaries, etc. 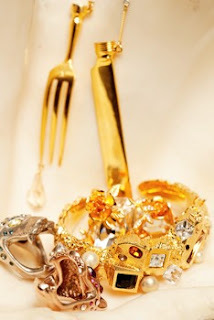 Bling: a term derived from U.S. rap slang to signify wealth and expensive accessories; flashy, ostentatious jewellery; a sound suggestive of the glitter of jewels and precious metals. Titling book can be a complicated, not to mention fraught, undertaking. Clever puns and smart-arse wording are well and good when conjuring snappy magazine headlines, but when the bottom line’s on the line a book needs a title that will appeal as much to the interested outsider as to an industry veteran. 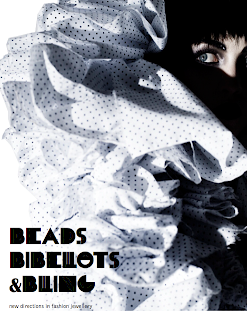 My first proposal was Beads, Bibelots & Bling, for the (so I thought) succinct way it captured the diversity of designer fashion jewellery. I was quite pleased with the alliteration, too. My publisher was less keen, saying it sounded like the title of an academic paper. 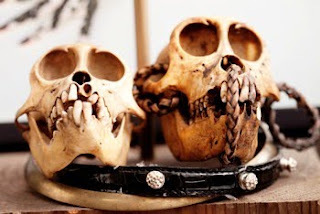 In the end Mr Laurence King himself made the merciful decision to go with Fashion Jewellery: Catwalk and Couture. And bibelot went to a good home after all. 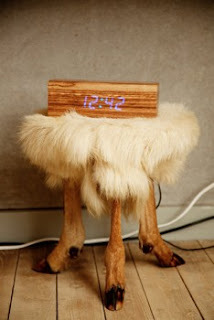 Call me lazy, but for reasons that will be revealed, time is of the essence. 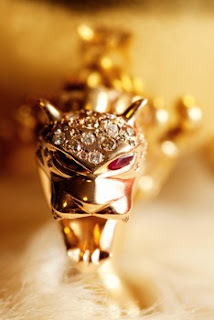 Putting my considerable talent for procrastination to good use, I've left it to the last minute to master the art of blogging and get this thing up and running as the undisputed online authority on all things jewellery. Yep, in precisely 1 hour I'll be emailing lots of influential people about a book I've written, and a little launch do I'm having next week, so for this reason – and this reason only – I'm committing the cardinal journalism sin and re-hashing a press release. Even worse - I'm re-hashing a press release I probably helped write, about myself. 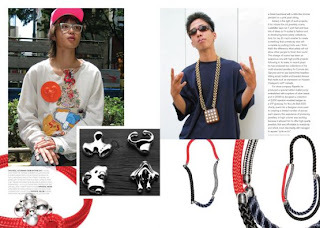 Fashion Jewellery is created with the catwalk and couture in mind, and is characterized by its creativity and originality. It is arguably the most exciting field in fashion today. 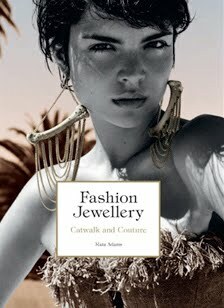 Arranged by designer, this is the first book to showcase contemporary catwalk and couture jewellery, profiling 33 international fashion jewellers who combine traditional techniques and ultra-modern methods to create this new style of jewellery. The book features exclusive interviews, never-seen-before sketches and specially commissioned photography. Collaborations with leading fashion designers and brands such as Lanvin, Vivienne Westwood, Alexander McQueen and Comme des Garçons, as well as collections for directional fashion stores such as Colette and 10 Corso Como are all discussed. Adams believes that the allure of fashion jewellery is the endless scope for re-invention and its applicability to different forms. The sheer range of materials, interpretations, philosophies and – importantly – humour, also make it endlessly fresh and exciting. Showcasing skilled craftsmanship and an often limited-edition approach fashion jewellery harnesses the spirit of couture for the 21st century. Ahem. Here's some spreads to lighten things up. Sometimes the stars align, once in a while fate smiles and – occasionally – things just work out. OK – so I also did a bit of low level stalking when I was in Paris for New Year (notes on napkins left with the staff at Colette etc), and I asked my well-connected friend Coco (Corinne) to pull hard on some strings but, hey, it did the trick. You’ll organise a book signing, by ME? !